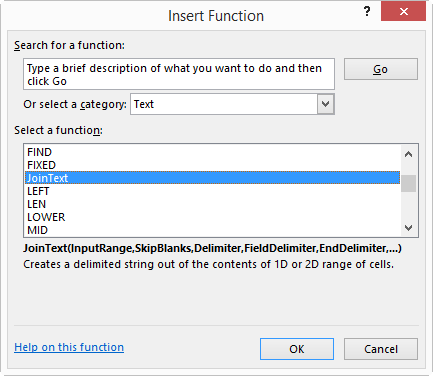 Even though you’ve seen Excel’s Formula Intellisense a million times, I bet there’s a few things that you don’t know about it that can make your life even easier. 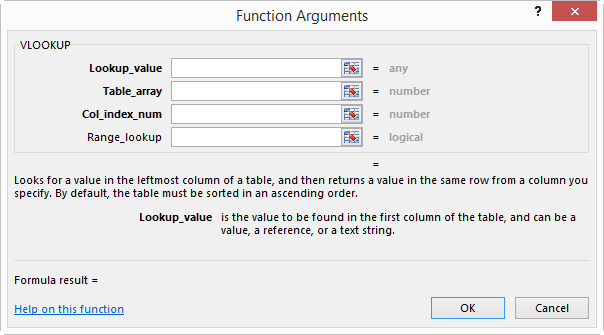 Let’s first look at an example for one of Excel’s in-built functions. Say we want to use an IFERROR function. 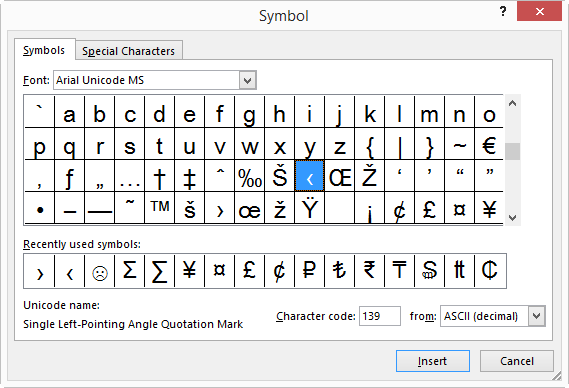 As soon as we type the = sign in the toolbar and the opening ‘I’ from IFERROR, Excel provides a helpful list of functions that start with the letter ‘I’, as well as a pop-up tool tip telling us what the currently highlighted function from that list does. That popup tool tip is often in the way, but you can move it somewhere else simply by clicking on it and dragging it to the naughty corner. …which you can then overtype with the actual arguments, now that you’ve been reminded what they are. How cool is that! But with our UDF, we don’t get that tool-tip pop-up. …but where’s the fun in that? Any character in the range 128-255 is allowable. That’s right, you can copy-write and trademark your variable names if you want! Yup, that compiles. And how does it look when we Ctrl + Shift + A that sucker? Welcome to “Excel…not quite finished” week. The great “Your Name Here” competition. You were right, I didn’t know that. If we remember to press Tab, then Ctrl-shift-A, and then click the formula icon next to the formula bar we get a whole load of #Name messages in red down the right hand side, because our UDF variable names are not range names. But if we create the range names, and add some helpful text to those ranges, we get some help text to go along with our helpful variable names. Alternatively, we could put some typical data in those ranges, so we can remember what sort of data is required, and the dialog box will give us a typical result for the UDF. A lot of possibilities there. True, never though of that. But you’d have to store your Named Ranges in a template I guess. And they’d have to have the same message an any other UDF. Food for thought, though. Nice approach to use the brackets. Haha, I always hit “Enter” instead of “Tab” and it always pisses me off because I have to start all over! Very cool trick with the Ctrl+Shift+A, I had never heard of that gem before! Ctrl+Shift+A, that’s a very useful trick. 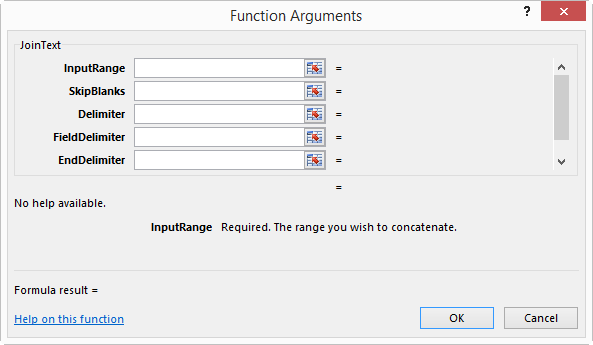 Excel 2010 and later have the option to register descriptions of the arguments of a UDF using MacroOptions (like snb uses). Instead of CTRL+SHIFT+A you can use CTRL+A to get the function dialog (or just hit the fx button next to the formula box). It shows the required arguments in bold and the optional ones in err.., well, not bold. An additional advantage of registering the UDF is that it changes the capitalization of the function in the worksheet formula to how the UDF was declared. So, if in a worksheet formula you would type “=jointext(” etc, it would cange that to “=JoinText(” etc, so you would know immediately if your UDF was recognized. That’s why it is a good habit to declare all your UDFs wit a mixture of capitals and lowercase. 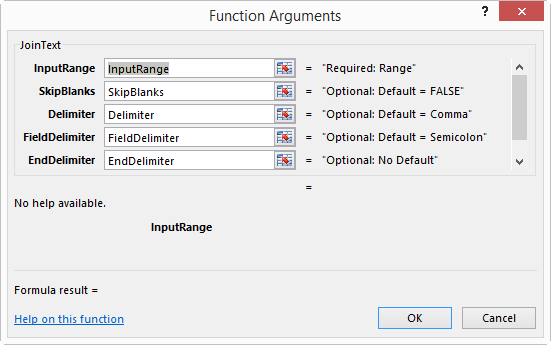 Of course you should not hard-code the arguments for the MacroOptions sub, but put all the required information in a worksheet table, so it can be maintained easily and executed automatically. b. I often read complaints that it isn’t reliable. I can assure you that the Excel 2010 onwards method is both reliable and easy. Let me know if you would like an example. I should have added that MacroOptions (Excel 2010 onwards) also gives you the option to add Help text for the UDF. The link to it can be handled in the same worksheet table as the other UDF information. Hi snb & Niek. I’d missed that enhancement re registering arguments. Serves me right for not upgrading my Excel 2007 Power Programming with VBA when I upgraded from Excel 2007! Thanks for that. To get the description of the optional argument unbolded, you have to leave out the type declaration. Ah, awesome. I’m pleased you’re part of my extended hive mind, Niek! And when you omit the type declaration, you have to test for missing arguments yourself. Jeff, your article was a revelation. Ctrl+Shift+A just may change my life. Also, I am *TOTALLY* going to start using pilcrow’s in my variable names now. Like a BOSS. Add away, Niek. I guess the downside of declaring as variant is speed. So I’d probably forego having my optional arguments bolded in UDFs, because you never know how many UDFs are going to get stuffed into someone’s spreadsheet. But very good to know. Jeff: Yes, I know, the pilcrow is that paragraph-marker thingy. Looking forward to the book! Niek: Thanks for the reminder on MacroOptions! I have been sort of aware of the MacroOptions option for some time, but I never actually use it, which is crazy considering the number of UDFs I use. So thanks snb and Niek for the reminder; I will start doing this as a matter of course today. Great tip, Jeff, I didn’t know about CTRL+SHIFT+A. and press CTRL+SHIFT+A and then simply press ENTER to complete the formula, it returns 0. It doesn’t return #NAME? which means that Excel *knows* what ARG1 is. It’s not stored as a name, so what is ARG1 (other than being an Empty Variant) and where is it kept? Jeff, right at the end you ask the question: down side? My immediate thought was: how annoying would it be to try and program when all your variable names start with a funky ASCII character? Or will autocomplete work if you start typing the remaining characters in the VBE? 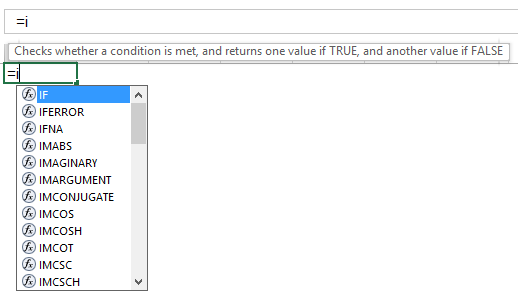 MacroOptions has existed for a while, but it didn’t become actually useful until Excel 2010. Colin, Isn’t ARG1 just a cell reference? If you select the formula you can press Ctrl+[ to take you to the cell (then press F5 and Enter to return). Does anybody know how to unassign a UDF after using Application.MacroOptions? I know that I can move it to another category, but how do I remove it from all categories as well as from “All”? @Lori – BINGO! You’re a genius! Pingback: How to explain the function inputs to the user? plus a detachable ToolTip for each literal. Does anyone know how to create these using VBA for UDFs? By the way, how can I add a screenshot (PNG) when I post a comment here? Also, I don’t know of any way to do that for your own functions. I learned they now call it Formula AutoComplete with Enumerated Constants: “The following functions have arguments with enumerated constants that automatically display in the drop-down list: CELL, FV, HLOOKUP, MATCH, PMT, PV, RANK, SUBTOTAL, and VLOOKUP.” But they forgot INFO. Does anyone know if there’s a method like MacroOptions to populate this enumeration?